I’ve done something beautifully annoying. It’s inconsistent, expensive, but so hillarious when it works properly… I have a lots of fun and don’t have other choice since I wasted 6k spirit on this. Coldbiter+Dredger or Wanderlust for Avalanche. Tracer for leaving your side of the board. Mirrorrim+Mentor or Fugitive for burn. Lots of stall and control - Enfeeble, Shroud, Frostburn, Gravity Well all ready to be Alcuined for infinite reusability while you stun all nearby minions with Coldbiter+Winterblade. I love the idea. 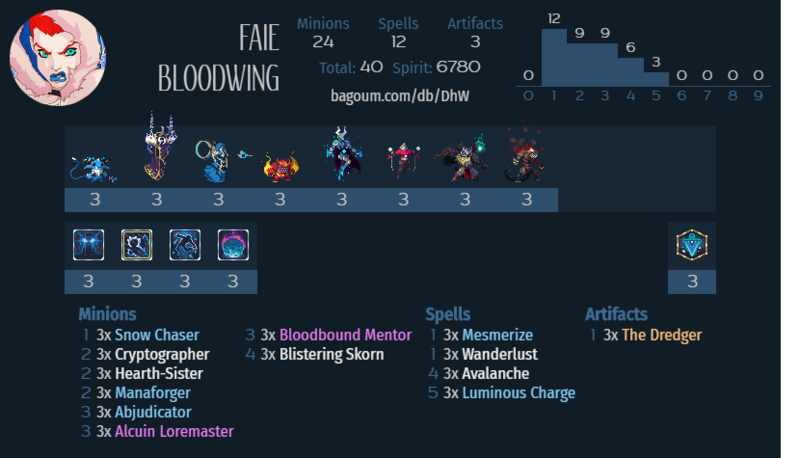 I tried making a similar deck with Ilena before (I can’t get myself to play Faie) but there is just not enough damage without that Warbird bbs. Damn son this is beautiful! 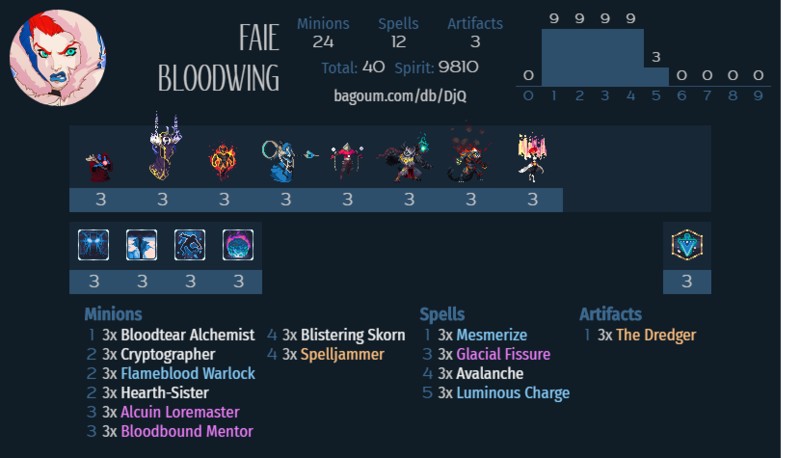 Second wardl’s opinion, faie is better with artifacts. I would however drop frostburn since on 6 mana this is weak. You have gravity well soo… maybe aotm? She definitely is. I remember playing artifact Faie before the release of Ilena. I just feel bad when I warbird my way to victory. But maybe this deck is what I need to have fun with Faie. You can always include grone lion and piercers and riddle you enemy with stab wounds. Honestly, Warbird is just too good and meshes well with everything, no context. Ileny mostly needs tools and techs to make her headbashy tentencies less suicidal and her control stabler instead of further shoving “IF STUNNED” gimmicks. I played the deck a bit and got to use all the cards except The Dredger, Morrorim and Aspect. It doesn’t look like games take long enough to get to the sweet point where I can chain avalanche my opponent. I did get an awesome clear with all three Coldbiters equiped though. Maybe replace the Mirrorims with Hearth-Sisters for more positional synergy. Yeah, I do not Avalanche often, but it’s awesome against ArtiReva and Trial Sajj. Speaking of Frostburn - it’s the only way to deal with Lilithe for me. Coldbiter is not enough. Mountain aspect has limited range, so I’m not sure on it. In my games mirrorring Mentor saved me a couple of times. I played mentor 5 times in one game for insane burn. Initial design from @crashdummy (link is in the OP) uses manaforger and Mali Wisp to ramp, but no Mentors, so I guess you could go that route. But Shroud is essential. Vanar has no healing, this is the only way to preserve your health. That’s basically the first thing i came up with. Kinda, guess i’ll try it a bit and adjust it accordingly. Noob question on the dredger? Well, guess i’m kinda hijacking this thread but I guess it’s a good place to discuss a similar deck. The only card that still doesn’t convince me is alcuin. It’s nice cause it’s some kind of wild card, sometimes it’s fun to steal opponent’s spell, and at worst you can cycle the spell, but most of the time it works like an overcosted cryptographer since the key spells are expensive.